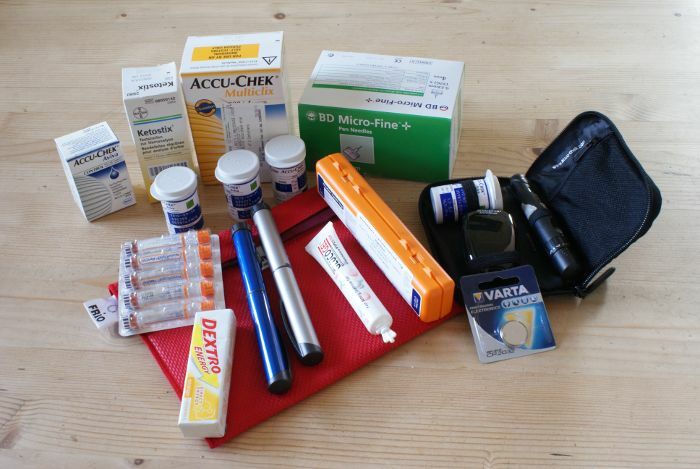 Pack back-ups: Wearing an insulin pump? Bring a few more infusion set changes than you think you’ll need. Have a long-acting insulin and fast-acting insulin pen in your carry-on, just in case your pump craps out. I always keep a few syringes in my bag, too on the off chance that I’ll need them. And if I’m planning on being away for a week or more, I’ll bring an extra vial of insulin, in case I smash one on the bathroom floor. Keep a solid glucose supply: With airport security different in every city and country, you never know when a juice box will be tossed as contraband. Keep your glucose supplies non-liquid, if you can. I keep jars of glucose tabs in my backpack and one of those box of 6-packs in my carry-on in case of lows. Wear a medical alert ID: A medical ID speaks for you when you can’t speak for yourself and with the unpredictable nature of diabetes sometimes peaking during travel, it’s crucial to have your bases covered. Wear something that says you have diabetes – a necklace, a bracelet, a tattoo, whatever you can help someone help you if you need it. And the medical alert jewelry available today in an upgrade compared to the crap we used to have to wear, so there’s that bonus. Know where you are: As someone with a useless sense of direction and an equally useless pancreas, resources that help with direction are key. Whether I’m trying to get back to my hotel or am in need of the closest medical facility. You can download maps of the cities you’re visiting before you even get on the plane and the maps work in real-time and don’t require cell service/ wifi to use while you’re out. If you’re not a fan of smartphone technology, do some research ahead of travel to scope out the nearest medical resources. Either method will arm you with important information. Have fun: Hell yes have fun, because traveling with diabetes is completely and utterly doable. And there is fun to be had and stuff to see.